What Are Baby Growth Spurts? When Do Baby Growth Spurts Happen? A growth spurt is precisely what it sounds like: a sudden burst of rapid growth in babies. It could literally mean that one day your baby fits into her 3-month onesie and the next you cannot button it. The growth usually includes an increase in weight, height, and head circumference. Every baby is unique; there is no growth spurt timeline that is set in stone. Depending on your baby’s developmental progress and specific biological factors (even including gender), it may go through growth spurts at a different pace than your friend’s baby. However, there is a basic age timeline you can refer to when it comes to growth spurts. Beyond your child’s first year, you can expect to see a growth spurt every couple of months through its second year, and on occasion right up through the teenage years. Knowing the basic timeline, you can anticipate when to keep an eye out for the symptoms and be prepared to handle them. Increased appetite: your baby’s body is working extra hard when it is growing, and hard work creates a nearly insatiable hunger. This can mean either longer feeds (getting in more milk in one sitting) or feeds that are more frequent. Either way, you could be looking at a caloric increase anywhere from 20 to 100 percent compared to regular feedings. Poor demeanor: considering the fact that growth spurts can still happen in the teenage years, we all most likely remember the achy bones that came along with one. With the literal growing pains, your baby is likely to be more clingy, fussy, and cranky, due to both physical pain and increased hunger. Increased sleep: we already acknowledged that your baby’s body is working hard when it is growing, so the need for more sleep makes sense. However, increased sleep is not only due to the physical tiredness. During a growth spurt, the pituitary gland releases human growth hormone (HGH), which helps your baby to grow, and this hormone is produced while your baby is sleeping. So, if you notice your little one is more tired than usual, and you think it may be going through a growth spurt, do not be afraid to let it sleep for as long as it needs. This way you are actually aiding in its growth. Restlessness: you may be thinking that restlessness contradicts what we just went over, but restlessness is different from insomnia, or sleeplessness. Your baby likely wants to sleep but it is either unable to get physically comfortable, or it may just be waking more often to feed (if your baby is still taking milk through the night). No parent likes to see their little one uncomfortable. We all wish there were something we could do to help. While we cannot “cure” the discomforts of a growth spurt, we can be supportive to help our children get through it. The best thing you can do is to follow your baby’s lead. This includes sleeping time and feeding cues. If you notice your baby is sleeping or eating more than usual, you may conclude that it is going through a growth spurt. Allow your child to determine how much it eats and sleeps during this time. Do not try to force more food because you feel the baby needs it, and do not keep your child from sleeping in order to keep your “schedule.” The growth spurt should only last a couple of days, and then your baby will be back to normal again. Also, don’t worry about your milk production. I have been there before. If you are breastfeeding, you may have times worrying that you will not be able to keep up with your baby’s appetite, but the female body is an amazing thing. Your milk production is based on supply and demand, meaning that if your baby eats more, your body will recognize the need and produce more milk to keep up. So, do not be afraid to let your baby nurse for as long as it needs to during this time. When all else fails, comfort and patience go a long way. It is easy to feel overwhelmed during these times, especially when your baby is young and only able to communicate by crying. Respond to it positively, and try to take its mind away from discomfort. Take a walk outside, or read books and play with toys together. Your baby will be glad for the distractions and happy for the bonding time. As we already mentioned, if you are breastfeeding there is very little you need to worry about. However, it is a bit trickier for the formula-fed babies. With formula, you are responsible for every aspect of the feeding: when it happens, the quality of the product, and how much is produced. Due to this, you will need to be more conscious when preparing for feeding time. Do not switch to regular milk: while it may be tempting, as you are thinking it will fill your baby’s tummy for longer, avoid giving in. The makeup of cow’s milk will be more difficult for its stomach to break down. Do not compromise quality: it may also be tempting to make the formula thicker by using less water, believing it will fill your child’s stomach better. Not mixing the formula correctly can also lead to more difficult digestion, causing your little one to become gassy or constipated. Do not overfeed: it will be difficult to determine precisely how much your baby will need to eat during this time, and finishing a bottle only to have a crying baby in need of a second can leave you frustrated and tired. You may want to make extra to ensure your baby is full by the end of her feeding, but you need to make sure you still pay attention to her cues. You can avoid overfeeding it by taking the bottle away when it loses interest or begins to fall asleep. Other things that may come up in your child’s development that can mimic certain symptoms of growth spurts, such as discomfort, restlessness, and tiredness. 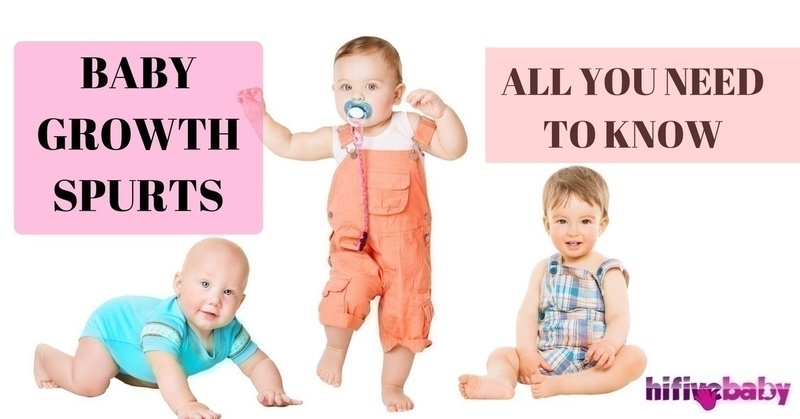 Teething: a bout of teething can be difficult for both baby and parents. My little girl had a particularly difficult time when it came to her molars and canines. She would become overly clingy and fussy, never wanting me to put her down or leave her alone at bedtime. Illness: we all know how a bad cold can knock us down; it can be substantially worse for your baby. Even a simple head cold is enough to either make your baby sleep more or wake more frequently (especially if it is congested and cannot breathe), and cause it to become increasingly fussy. Developmental milestone: reaching certain milestones, such as crawling and rolling over, can increase restlessness in your baby. She may find it hard to settle down at night or remain asleep due to the increased brain activity and desire to practice her new skills. It is such a joy and a privilege to watch your baby grow before your very eyes, but it can also be difficult to get through growth spurt phases. With an increased appetite and a decline in behavior, you may be anxious to get through it as quickly as possible. Be patient, listen to your child’s needs, and respond positively, and it will be over before you know it. And remember to treasure every moment, because they truly do grow fast. Questions or comments? Let us know! Do not forget to share this link with other parents who may be looking for some guidance.